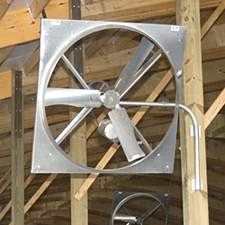 As the name implies, recirculation or circulation fans are designed to circulate air throughout your barn or building. The main purpose of air recirculation is to cool and control the climate to reduce heat stress on your animals and keep production at the maximum level. Recirculation fans keep your building dry by reducing the collection of moisture and condensation, and will also dispel gasses and odors. 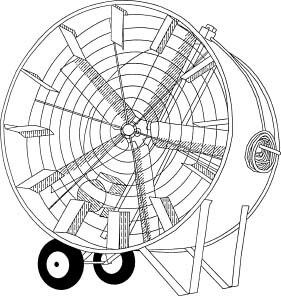 As a leading dairy ventilation manufacturer, J&D offers circulation fans of all shapes and sizes including Panel Fans, Galvanized Box Fans, Basket Fans, Drum Fans, Ceiling Fans, Pedestal Fans and Funnel Fans for both indoor and outdoor use. Our circulation fans range in size from our 12" basket fans to our 60" CF60A Indoor/Outdoor Ceiling Fan. 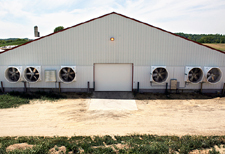 Exhaust fans are an excellent way to expel or exhaust the air in your barn or building. J&D manufactures a complete line of galvanized and fiberglass exhaust fans that are perfect for your tunnel or cross tunnel ventilated barn. Our exhaust fans range from a 10" ES Shutter Fan to our 72" Mega Storm fiberglass exhaust fan. CONE FAN - Higher, Quieter Air Flow - Aerodynamically Engineered!